Tomas Rosicky set to say goodbye to Arsenal Arsenal veteran Tomas Rosicky is set to say goodbye to the Gunners as his contract expires next month. 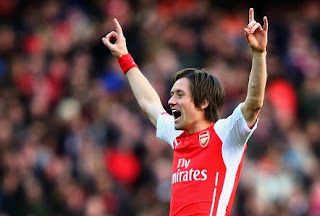 Arsenal veteran Tomas Rosicky is set to say goodbye to the Gunners as his contract expires next month. The Czech international who is one of the most senior player at the Emirates at the moment will be leaving the Gunners on a free transfer this summer. The 34-year-old is in talks with his old side Sparta Prague from where he started his career. His boyhood club wants him to play for them before announcing his retirement. He has only made 14 Premier League appearances this season for the Gunners because of the completion in the midfield. Santi Cazorla, Mesut Ozil and Alexis Sanchez all are at top of their form. The Gunners have no plans to offer him a new deal and the player also wants to leave the club as he eyes to end his career on high. The Gunners signed Rosicky from Borussia Dortmund in 2006 for an undisclosed fee. The attacking midfielder has made more than 240 appearances for the north London side since his move. Rosicky lifted only a FA Cup trophy in his entire Arsenal career. Meanwhile, the reports further claim that Theo Walcott, Mikel Arteta and injury prone Abou Diaby are also likely to leave the club. Walcott returned earlier this year from long term injury but has not been given enough chances due to tough competition in the squad. He has been targeted by Liverpool boss Brendan Rodgers.